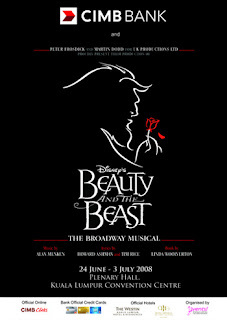 I saw Disney's Beauty and the Beast last night at the KLCC Plenary Hall. It was my first time to watch a musical here in KL and so I was very excited to watch this Tony awardwinning Broadway Musical brought to KL. The last major play I watched was Miss Saigon in Manila back in 2001 (with Lea playing Kim). I missed Mama Mia when I was in Hongkong back in 2004 so when I heard the news that a broadway musical was coming into town (the UK production), come hell or highwater I was determined to watch it. Reg, Wilai, Jesse and I managed to secure tickets in the upper balcony (thanks to Wilai's 30% discount, it cost only 105 RM instead of 150). It was quite far from the stage but still close enough to see the faces of the characters. After all we didnt need to be upclose since we are all familiar with the story of Belle and the enchanted beast. Though the story and songs were familiar, there was just something magical about watching a live action musical come to life infront of your very eyes. My favorite character was Lumierre who was so funny. Chip was as cute as ever. And true to form, Beast was still "cuter" when he was a beast instead of a Prince. The rest of the characters were funny and heartwarming. Even Gaston was lovable (talk about self esteem!) The highlight of the show was the "Be our Guest" number. But my favorite scene was when Beast let Belle go. Haay, how romantic. hahaha. I was a bit disappointed though when they changed the scenes for the "Something there" number. It was one of my favorite part in the original cartoon (when Beast and Belle were playing in the snow). And of course no one could still beat the original singers, especially Angela Lansburry's version of the theme. Belle's golden dress looked better in cartoons. In real life it looked like a giant cake topper. hahaha. I hated the audience members who were rudely texting and some were even taking pictures! Talk about poor theater etiquette. If you're going to just text the night away, why bother going to the theater at all. The play ended at about 11pm. For almost 2 hours I was magically transported to a world different from mine--where candlesticks and napkins dance, clocks and wardrobes talk, and a beast could be tamed. It was worth every ringgit spent.